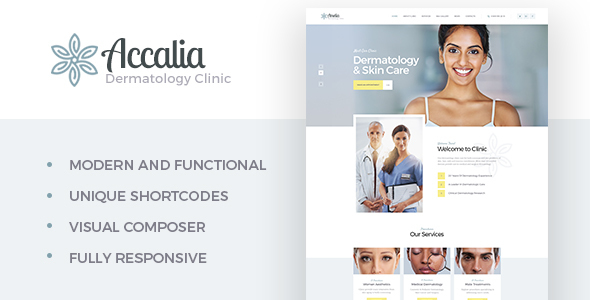 Accalia ia a highly versatile theme, suitable for any establishment of health and beauty industry, like dermatology clinic, cosmetology, hairstyling, spa, massage and beauty care, plastic or cosmetic surgery, etc. Accalia offers plenty of options to present relevant information about your beaty clinic, such as staff, location, testimonials, services, and many others. The theme supports the premium Booked plugin that enables patients to book appointments online. And, if you are planning on selling right from the website, WooCommerce compatibility is at your service.